Easy peanut butter dog treat recipe for you to create your own dog biscuits. Combine all dry ingredients in a mixing bowl and mix well. Add all wet ingredients and mix well until all ingredients hold together as one. You will have a thick dough. Sprinkle some whole wheat flour on a clean, dry surface and roll the dough flat about 1/4 inch thick. Using dog themed cookie cutters, cut desired shapes from the dough. Place cut shapes onto a non-stick baking surface or a surface that has been coated with a non-stick baking spray or parchment paper. Bake for 18-22 minutes on the middle rack of the oven. Turn off oven and let treats stay inside with the door closed for another 60 minutes. This allows them to get dry and hard if done correctly. Remove treats and decorate with Magifrost dog treat icing. This next one of the peanut butter dog treat recipe ideas calls for using a pre-packaged dog biscuit mix. It's a simple dog treat recipe. Just mix the contents of the package and go! Prepare a pre-greased cookie sheet and set aside. Put the honey into a saucepan and heat over low heat. Stir in the pieces of apple and coat them with the honey. Turn off the heat and pour the mixture into a bowl. Stir the peanut butter into the hot apples and honey and mix well until the apple pieces are completely coated. (Microwaving the peanut butter for 30-60 seconds will make it easier to stir.) Put this mixture aside. Prepare the dog biscuit mix as directed on the package. Add the apple mixture to the biscuit mix and stir well. Using a small spoon, drop bite-sized bits of the mixture onto the cookie sheet. Bake 18-22 minutes on the middle rack until golden brown. Turn off oven and leave treats inside for 60 minutes to cool and firm up. After the biscuit drops are cool, prepare the frosting mix as directed for dipping. Dip each biscuit ball into it and place it on a non-stick surface to let the frosting harden. The white frosting will create the look of snowballs. For dogs that love peanut butter, this peanut butter dog treat recipe uses peanut powder for a healthy, consistent flavor. Peanut powder is an all natural product and does not contain sugar that is included in store-bought peanut butter which makes it more palatable to humans. Dogs do not need the sugary, sweet taste for a treat to taste good to them. Their heightened sense of smell helps them determine if they will like the dog treat. If your dog loves peanut butter treats, peanut powder is a good investment. 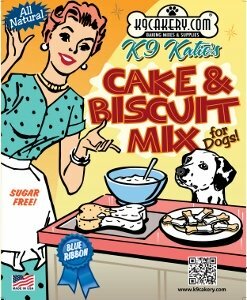 You can use it in dog cakes, and to add flavor and aroma to dog treat icing as well. Bananas are added to give it more pizazz! You can leave these out if your dog does not care for this fruit. You will see the cookies begin to pull away from the sides of the silicone pan. Decorate with Magifrost dog treat icing by drizzling the icing over the dog biscuits. For a "chocolate" icing look, you can color the icing with brown coloring. Or, add peanut powder to the icing for a "peanut butter" drizzle finish. Editor's Note: Although we recommend using all natural peanut powder as the best ingredient for "peanut butter" flavored treats, you can use all natural smooth peanut butter. This type usually does not contain the sugar found in the store brands popular with children for their PB&J sandwiches! 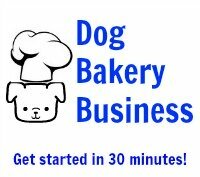 More great peanut butter dog treats featuring a peanut butter icing recipe.